Photo via Kate Jackson Interior Design. Photo via HGTV’s High Point Coverage. Photo via Swirls of Pearls. 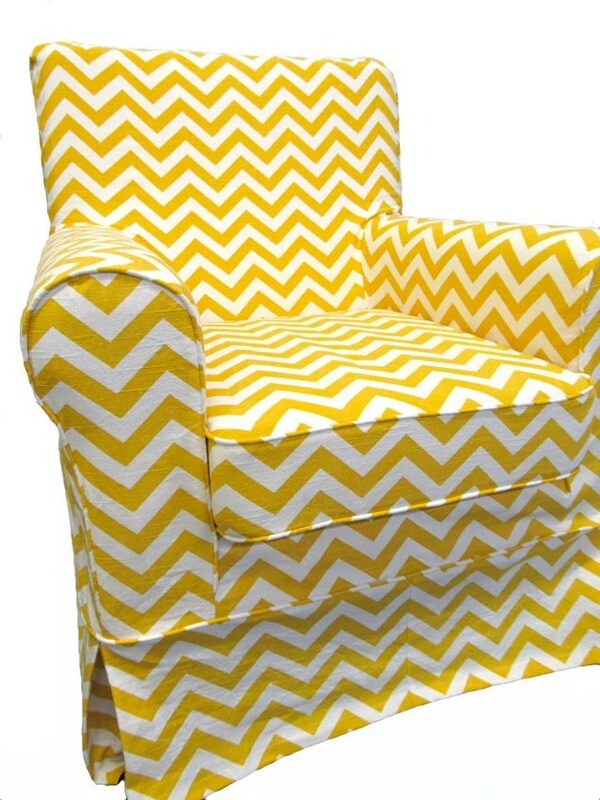 The chevron trend is still going strong. The pattern graced wallpaper, fabrics, throws, pillows, rugs, and more. via my iPhone. Slightly askew! Photo via High Point Market Style Spotters. 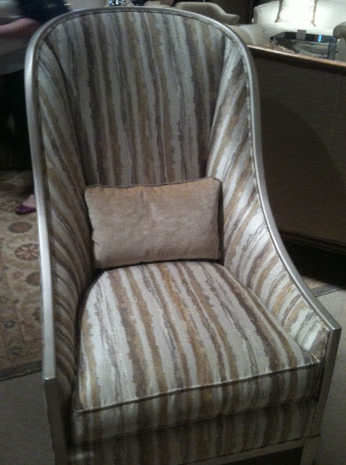 Photo of sofa in Thibaut showroom via Bright Bold Beautiful via Apartment Therapy. We saw a host of vibrant, rich, bold colors. 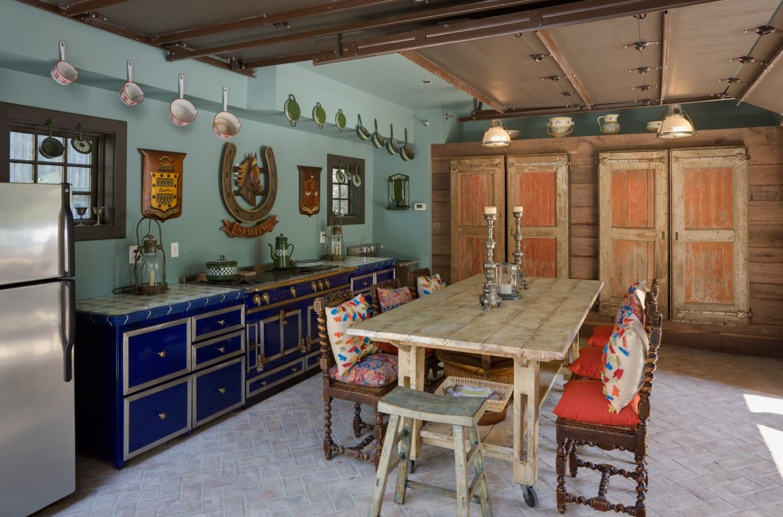 Eclectic design remains strong and incorporates color with unconventional pieces and accessories, such as the crackled, deep red ceramic bottles with perfectly aged undertones and the bright, distressed china cabinet. Bohemian style was also showcased, though to a lesser extent, relying on funky prints and rich hues as seen in the textiles above. Photo via High Point Market Style Spotters – Stacy Naquin. The metallic trend took High Point by storm. Lighting, accessories, and furniture were not exempt from glamorous high shine and gilded edges. Even cowhides were sprinkled with silver and gold as shown above. “Handcrafted” and “American Made” were among the buzzwords. The confetti cube pendant has that rustic, one-of-a-kind charm, while the quirky handmade dolls and hand-painted tribal bowls and platters would be perfect for any eclectic space. 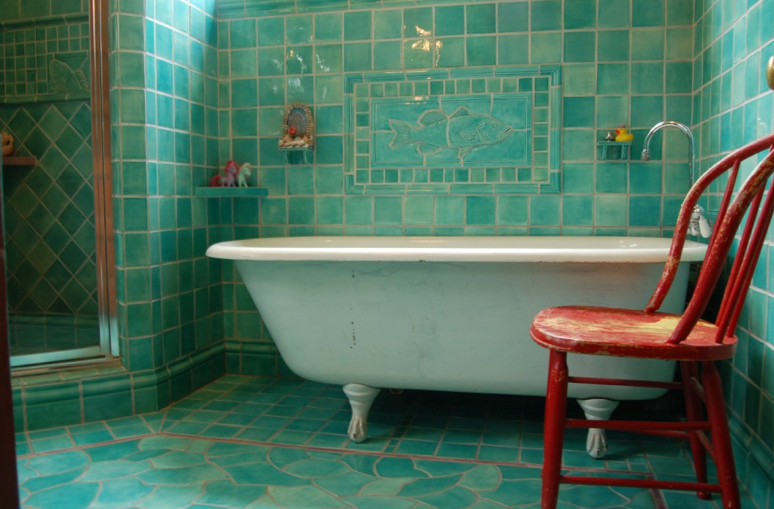 Via HGTV’s High Point coverage. Fun, colorful, funky, and daring. Need we say more? Photo via High Point Market Style Spotters on Pinterest. Via Heather Scott Home & Design. The vendors at High Point were all about texture. Mixing grosgrain ribbons with wooden chairs, pairing velvet with linen, and crafting ceiling lights that appeared to be adorned with leaves, was just the beginning. Burlap, comfy layers, and natural materials rounded out the bill. Claw Leg Saddle Stool via Noir. 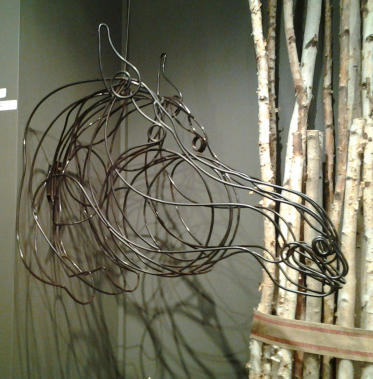 Gold Leaf’s wire horse wall art via MeCC Interiors. Photo via High Point Market Style Spotter Jennifer Mehditash. With hooves protruding from furniture, equestrian art, and figurines galore, horses were this year’s “it” animal. This fits perfectly with my love of equestrian-inspired design. 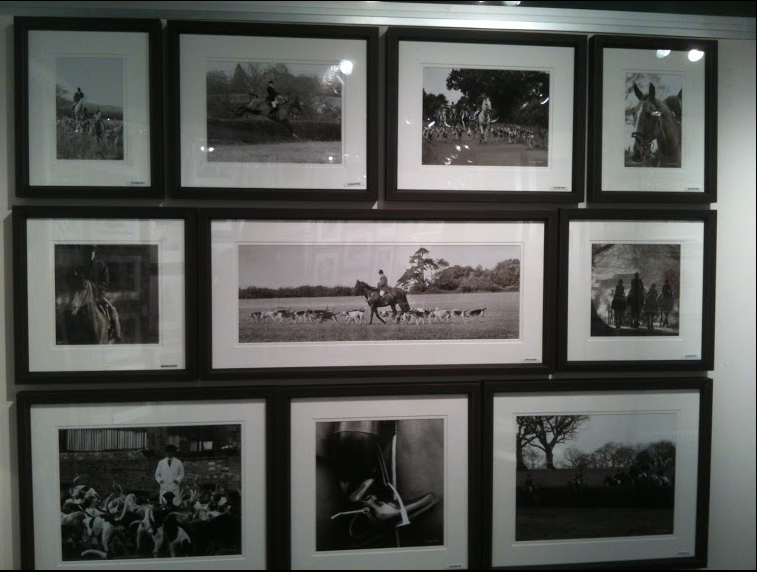 Or maybe anything equestrian just catches my eye, wherever it might be? What trends do you see on the horizon for the upcoming year? Categories: Interior Design & Decorating | Tags: 2013 interior design trends, equestrian design, High Point 2012, High Point Fall Market, Home Decor | Permalink. Response: “OMG I love Philadelphia Cream!” Followed by a 30 minute discussion on Philadelphia Cream versus some of our other favorite neutrals, while discovering that both of us used Philadelphia Cream in our dining rooms at one point of our lives. 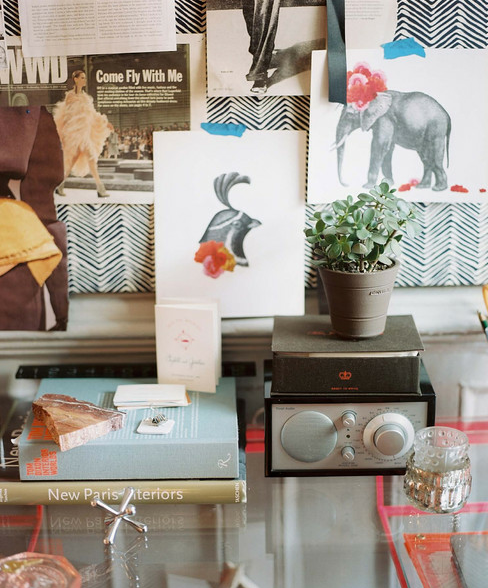 Photo via Apartment Therapy. Nook painted in Benjamin Moore’s Philadelphia Cream. Do you have these same experiences? What’s your favorite thing about connecting with others who share your passion? 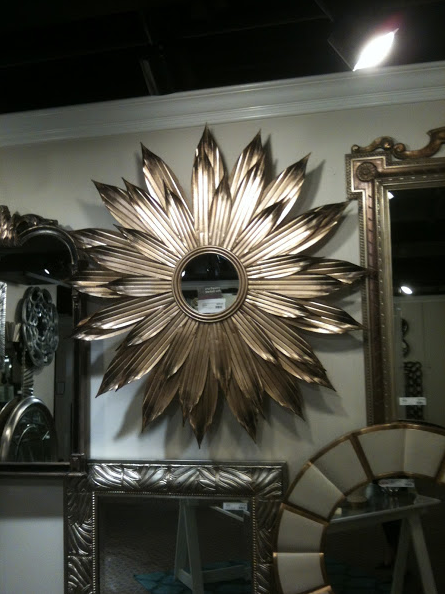 And yes this is one of the reasons I love going to the High Point Market (the count down has officially begun!). In addition to discovering new products, new trends, and of course inspiration everywhere, it is also wonderful and energizing to be surrounded by design/like minded people everywhere! Categories: Interior Design & Decorating | Tags: Benjamin Moore, design love, Fall Market, High Point, Home Decor, interior design, Market, paint colors, Philadelphia Cream | Permalink. Picture compliments of Apartment Therapy. 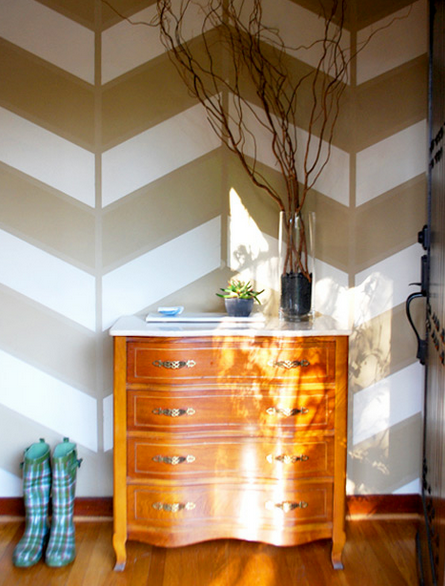 Herringbone is often considered classic and chevron is sometimes classified as more modern. 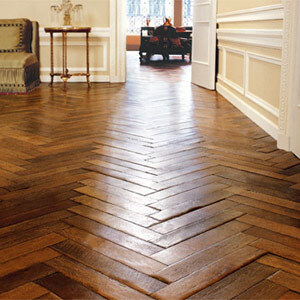 Though herringbone floors date back to the 1500s, chevron floors appeared shortly after in the 1600s. The trend has been revived and now the patterns grace all types of products and design. That’s it for the history lesson. Now on to the pictures. These herringbone floors complement the traditional space and give it depth. Porcelain tiles arranged in a herringbone pattern look sleek when paired with a rustic bench. The pattern also adds some drama. 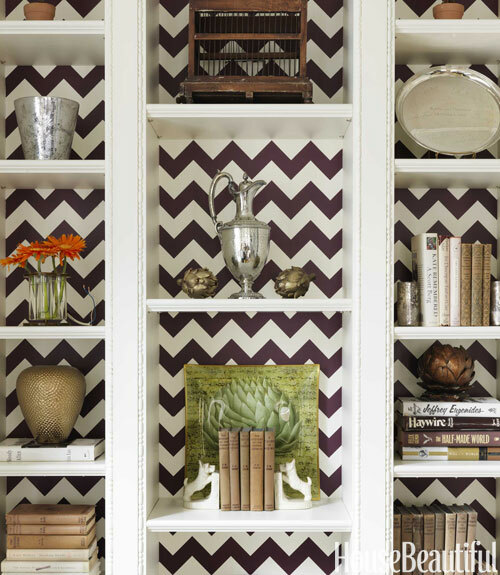 Hand painted chevron gives white built-in bookcases personality. 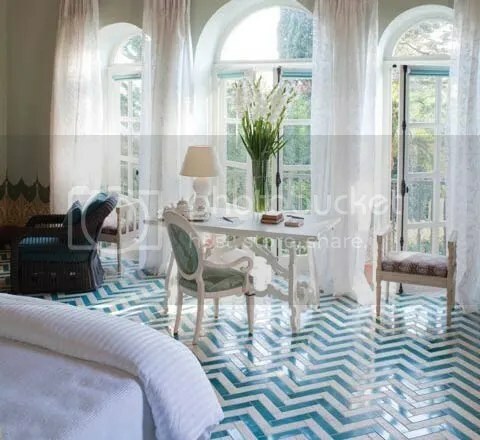 An amazing blue and white chevron floor. It really pops against the white. 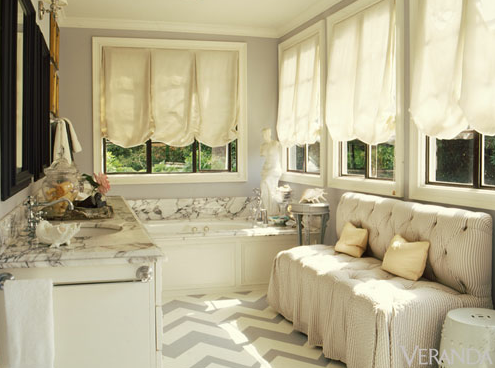 Mary McDonald used hand painted chevron floors to spruce up a formerly boring bathroom and make it current. The gray color of the floors matches a shade of gray in the marble. 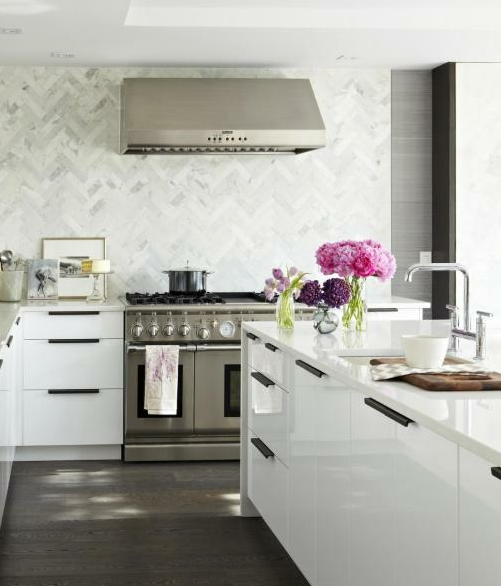 Modern kitchen with a breathtaking herringbone backsplash. DIY project! The owners used tape to create the pattern and then painted. 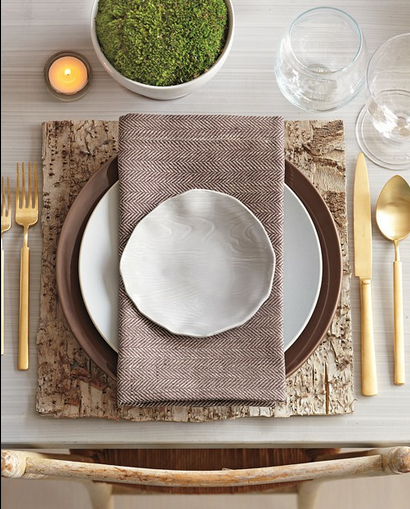 The herringbone napkins set the stage for a perfect place setting. The gold flatware gives the tailored pattern an elegant look. A bold chevron rug and orange accents keep the space from feeling too restrained. I love this unique use of pattern. 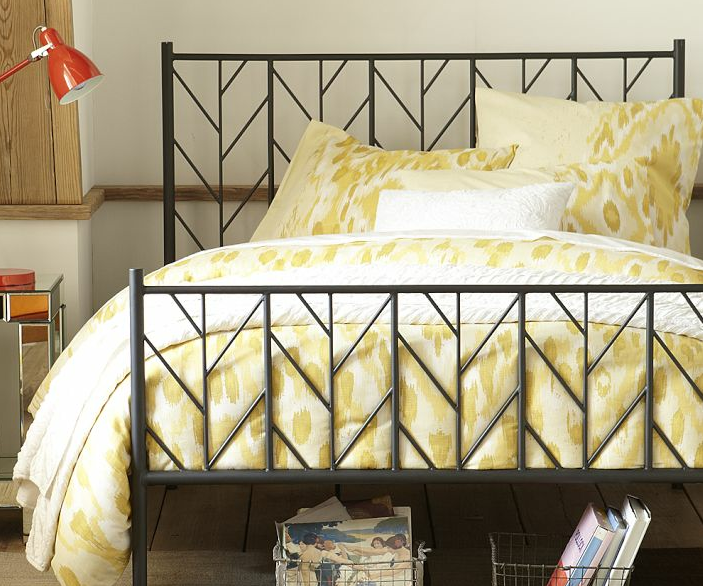 The metal bed frame features herringbone openwork making it the perfect focal point for the room. Which space is your favorite? 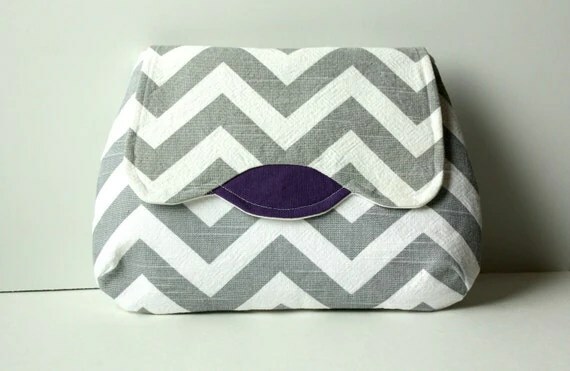 Are you team herringbone or team chevron? Categories: DIY, Interior Design & Decorating | Tags: Chevron, chevron floors, classic design, difference between chevron and herringbone, diy, eclectic design, furniture, herringbone, herringbone backsplash, herringbone floors, Home Decor, interior decorating, interior design, modern design, patterns | Permalink. Photo compliments of Decor Demon. Hollywood regency style captured with a refinished, red lacquer flea market find. Serious drama! Photo compliments of Elle Decor. 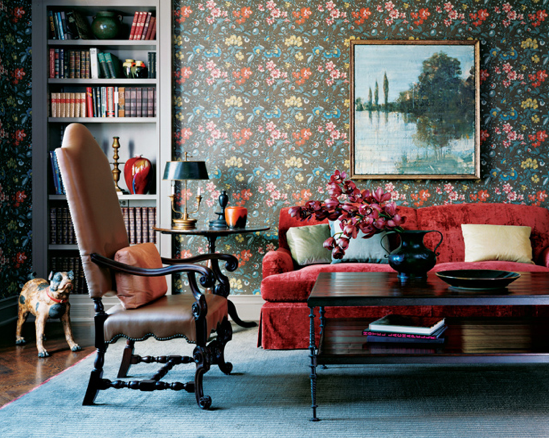 Paired with vintage wallpaper, this crushed velvet sofa creates an inviting ambiance. Though the wallpaper isn’t really my style, I love the dog and shades of red. Picture compliments of Chandelier Lighting Style. 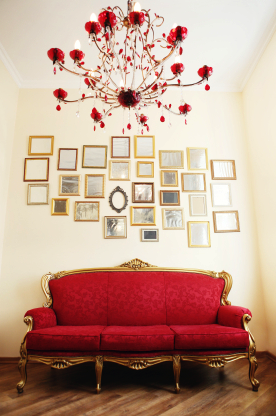 A modern red chandelier looks stunning when paired with a classic sofa and gold accents. 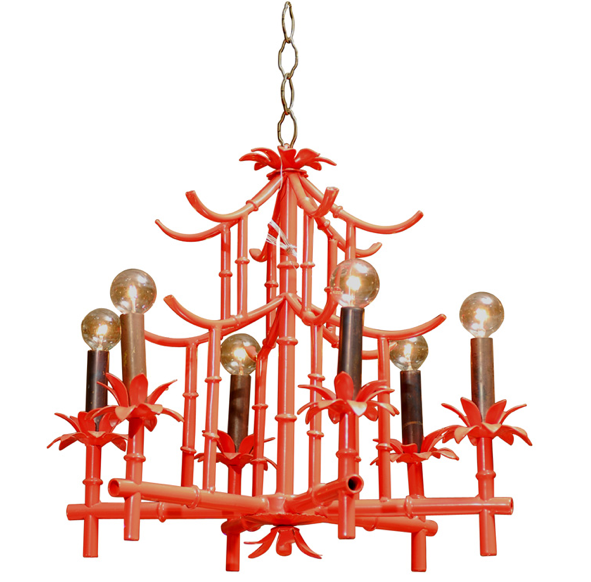 Incorporate glamorous Chinois style into your space with a vibrant pagoda chandelier. Photo compliments of iSpace Design. 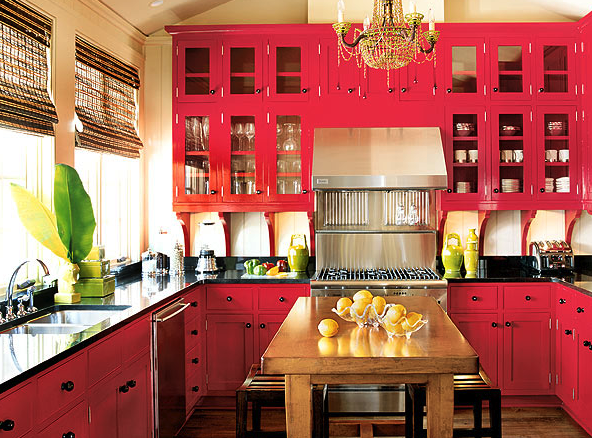 This dark, almost Victorian-era, red pops against the white and gray kitchen. Top it off with a white chandelier and you have a classy, modern space that doesn’t appear cold or sterile. 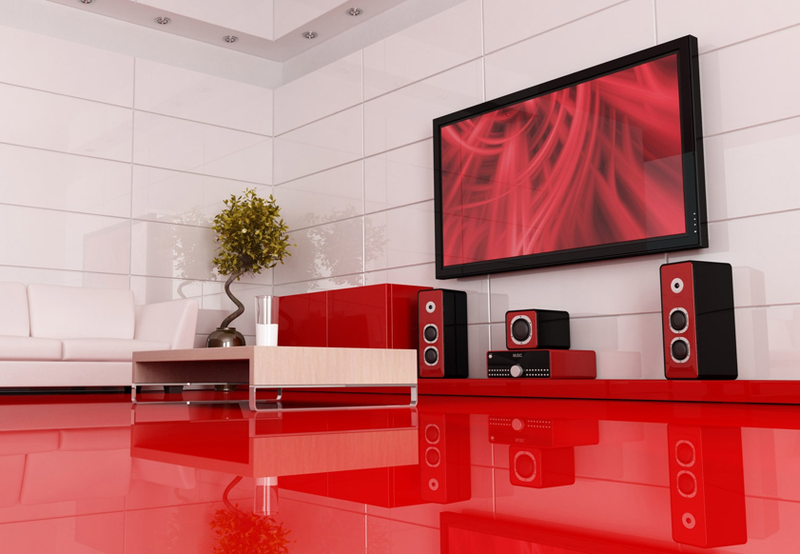 This high-shine, ultra-modern living room even incorporates red in the speakers. A space this bold is not for the faint of heart. Photo compliments of Design A Room. 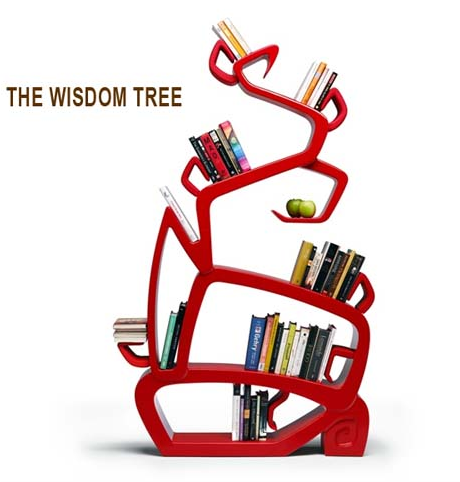 This utterly modern red shelf looks as if it was conjured up by Tim Burton. So unique. 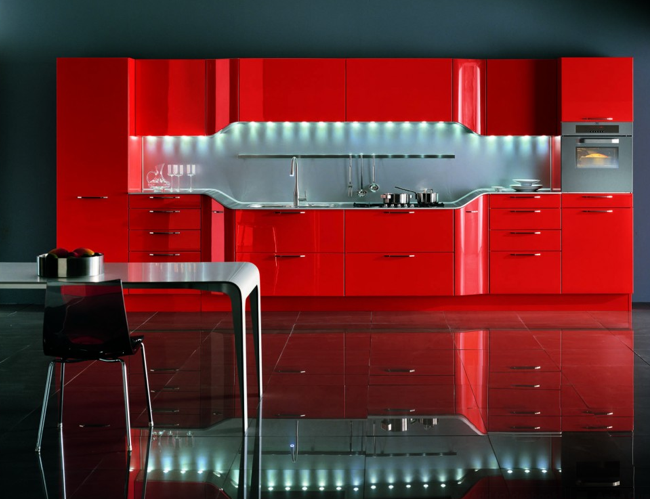 The key to pulling off this daring coral high gloss lacquer is keeping all other elements extremely simple. Photo compliments of Design Wagen. 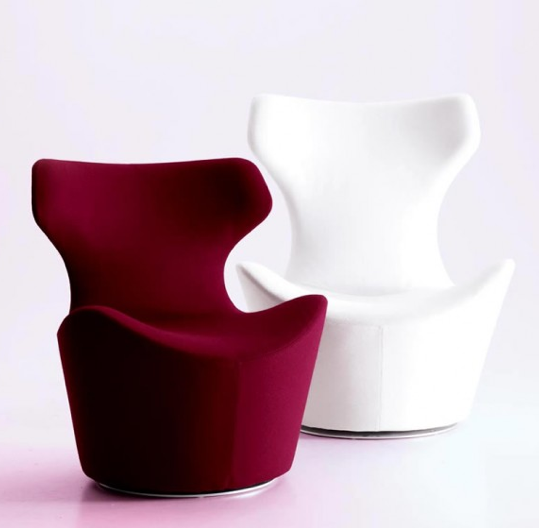 The Piccola Papilio chair by Naoto Fukasawa is perfect for small spaces and a simple way to introduce a dark, rich red into your color scheme. Photo compliments of Filmore Clark. Here’s a commitment-free use of red. For those who aren’t ready for a full-on red design, try accent pieces like a rustic chair or red throw pillows. Photo compliments of CoCo Cozy. Another way to sprinkle in some red accents. 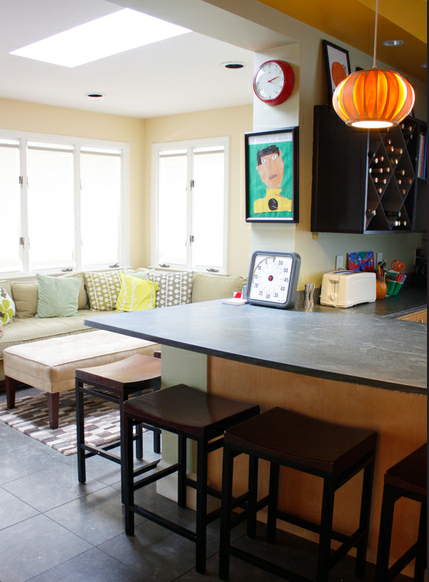 Photo compliments of Apartment Therapy. Beautiful red vintage claw foot tub and red and white wallpaper. The use of white, tones down the intensity of the red. Photo compliments of Modern Decorations. 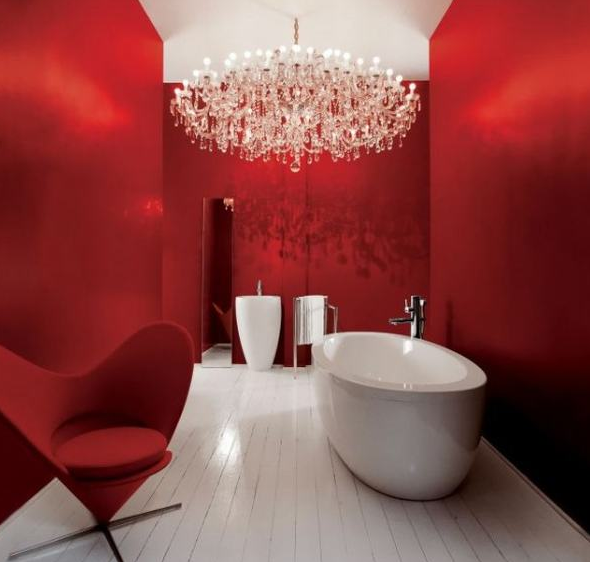 The deep red walls, sleek white fixtures, and dazzling chandelier create such a sultry look in this bathroom. 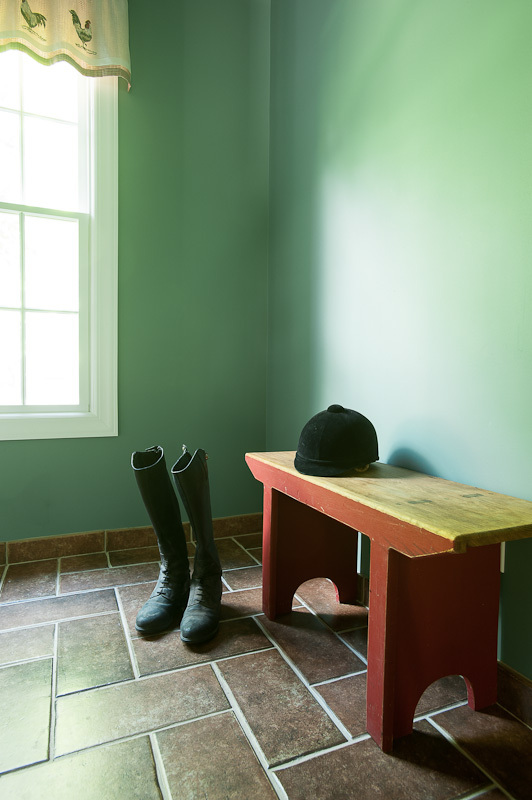 Photo compliments of Houzz user Becky Harris. 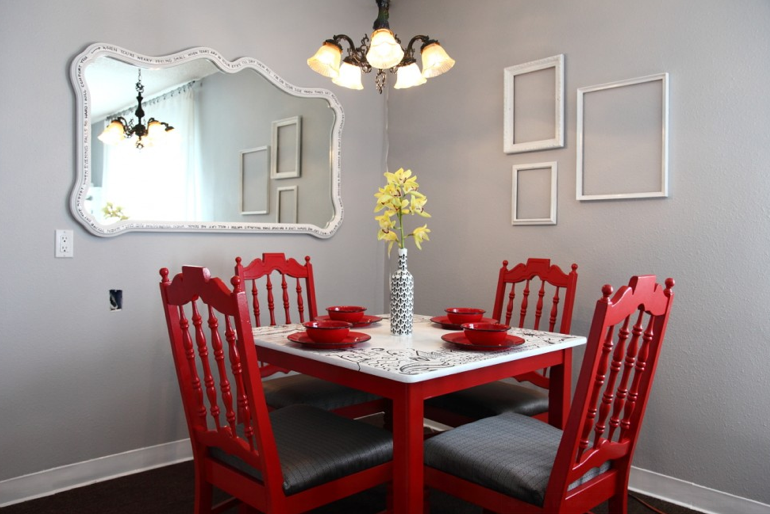 Perfect way to add interest to a neutral dining nook. Red stimulates the appetite! Photo compliments of Gaita Interiors. This homeowner manages to pull off bright red cabinets, without the ultra-modern look. The greens, yellows, and golds lend the space a cheerful vibe. Photo compliments of Belle Maison. 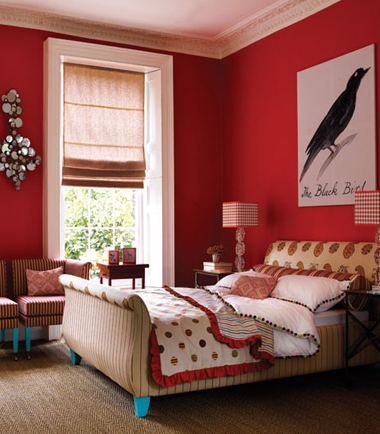 We couldn’t say goodbye without including at least one striking red bedroom. 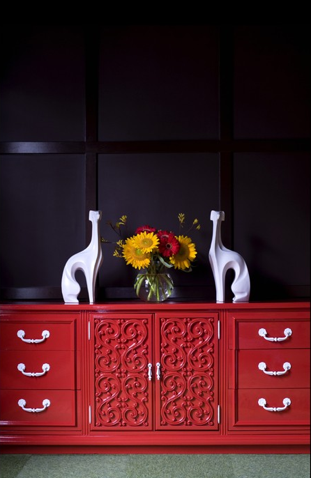 The turquoise, white, and red playful accents lighten up the space. Which one’s your favorite? Are you a fan of red? Categories: Interior Design & Decorating | Tags: Architecture, chandelier, color schemes, contemporary, Curtains, eclectic, flea market, Home Decor, Home Decorating, Interior Design & Decorating, modern, red, red bathroom, red bedroom, red decor, red furniture, red home accessories, red interior design, red kitchen, red paint, repurposed, style, traditional, vintage, Wallpaper | Permalink. 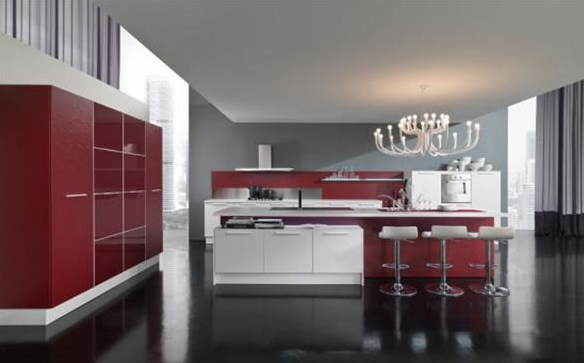 The kitchen can serve as the focal point of a home and some homeowners opt to go seriously bold. Here are some unique spaces that stand out from the crowd. Photo compliments of Camilla Molders Design. 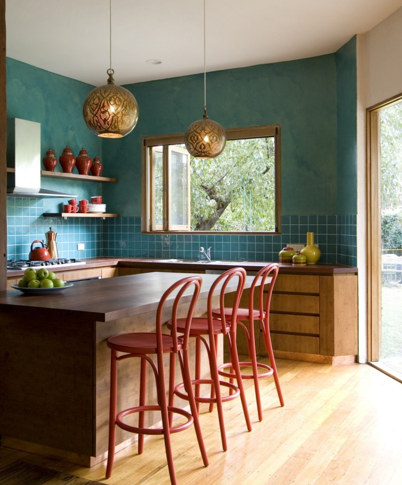 Eco-friendly space featuring bamboo cabinets, bench tops crafted from reclaimed iron bark, and unique turquoise tile. Photo compliments of Mal Corboy Designs. 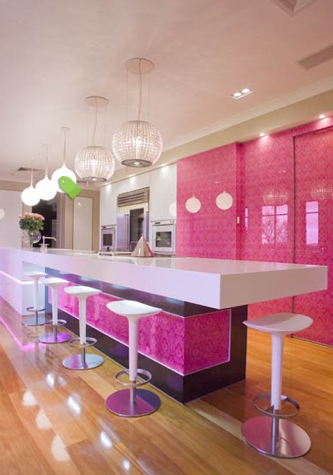 It would be remiss of us not to include this modern pink glass kitchen. It is daring. Hello Kitty’s vacation home? 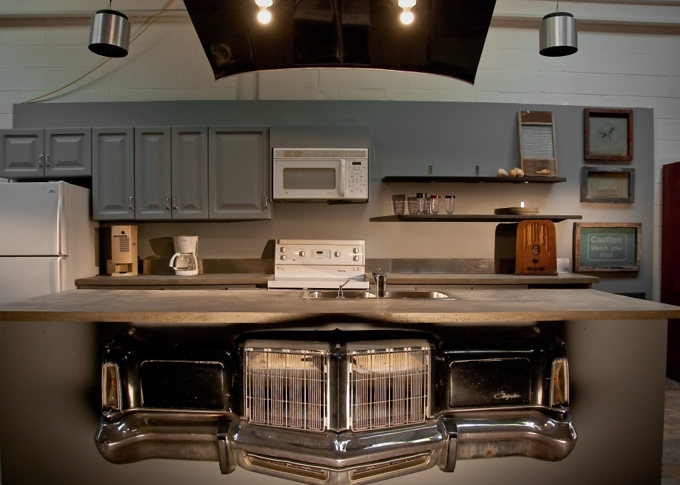 Photo compliments of Lucid Interior Design Inc. Yes. That is a car in a kitchen. Taking re-purposing to a whole new level. Photo courtesy of Dijeau Poage Construction. Green and gray kitchen. 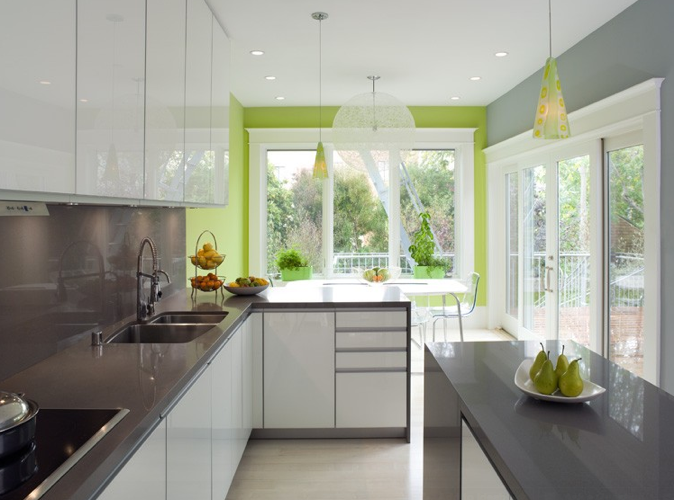 The green contrasts perfectly with the high shine dark gray counters. Photo compliments of Celia James. Cream and purple with a ceramic mosaic backsplash and black granite countertops. Photo compliments of Charlie & Co. Design, Ltd. Even white can be bold! Photo compliments of Joel Kelly Design. The stunning light fixture really pops against the black backdrop. 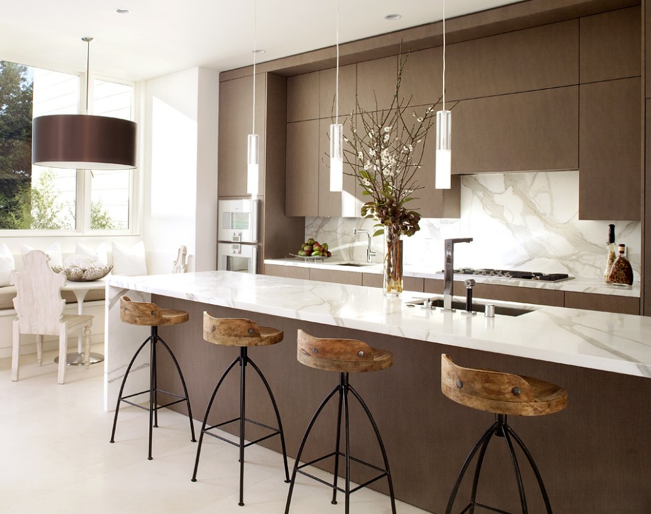 Photo compliments of Valerie Pasquiou Interiors + Design, Inc. 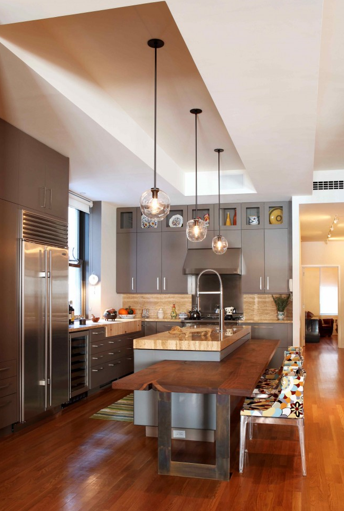 This New York City loft kitchen features industrial lighting, gray cabinetry, and funky chairs. Photo compliments of Oz Architects. 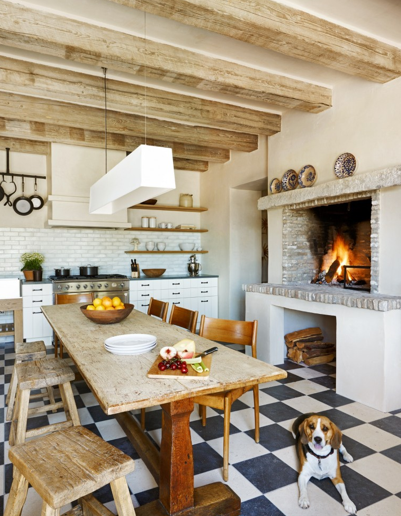 Eclectic rustic kitchen with a fireplace! Plus, a cute dog. Photo compliments of Jane Kim Design. 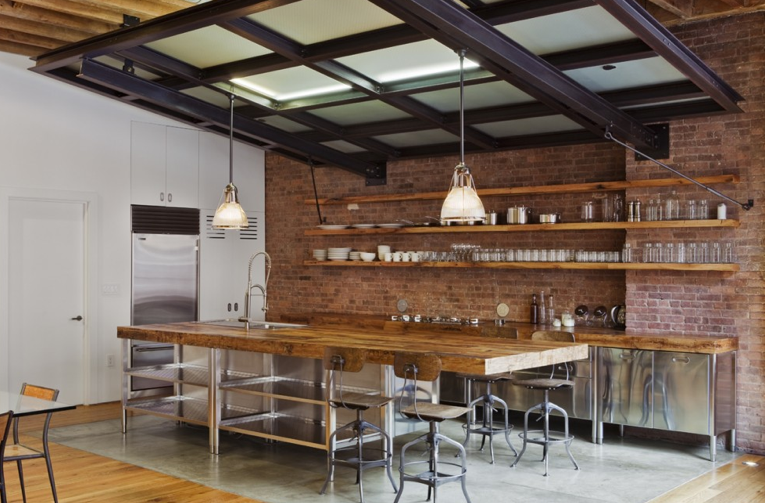 Open kitchen with no cabinets and an exposed brick accent wall. 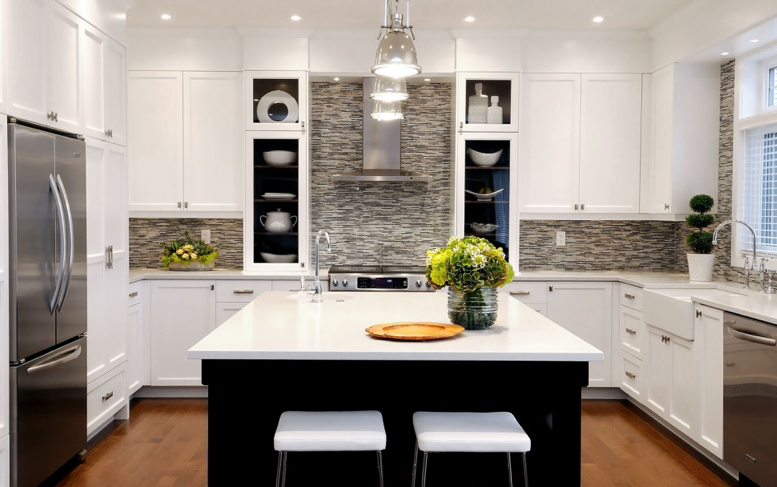 Photo compliments of Atmosphere Interior Design Inc.
Modern kitchen with industrial pendants and a beautiful black and gray tile mosaic backsplash. 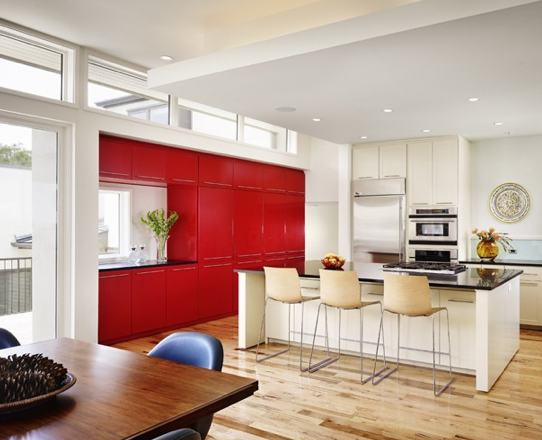 Bright, airy, with a pop of color in the form of red cabinetry. Photo compliments of John Maniscalco Architecture. Modern, minimalistic, yet surprisingly warm. Photo compliments of Archipelago Hawaii. 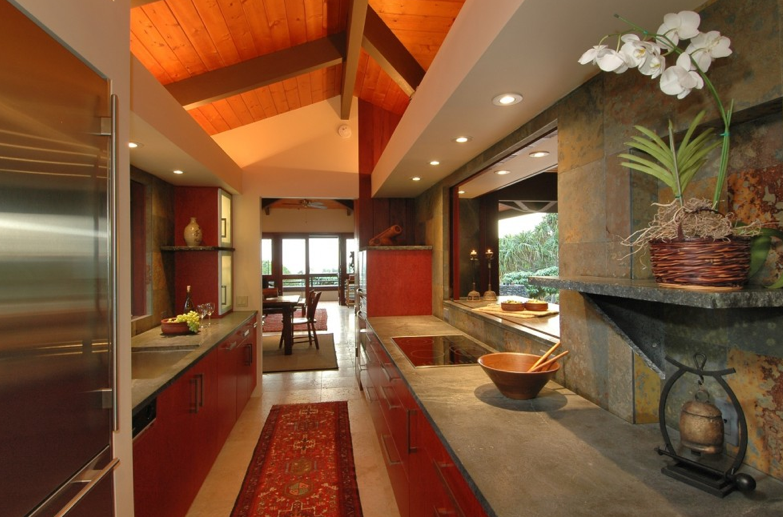 Tropical kitchen featuring soapstone counters and sky-high ceilings. Photo compliments of California Home + Design. 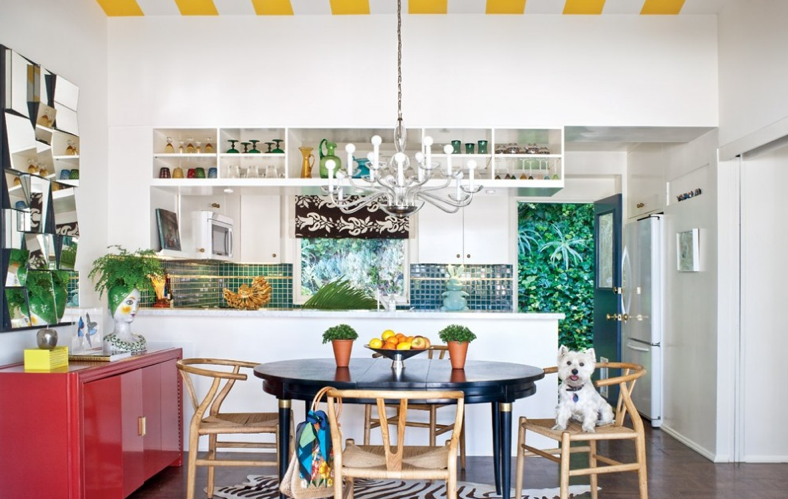 This playful, eclectic space combines periods, styles, and bold color. Photo compliments of Georgetown Development. 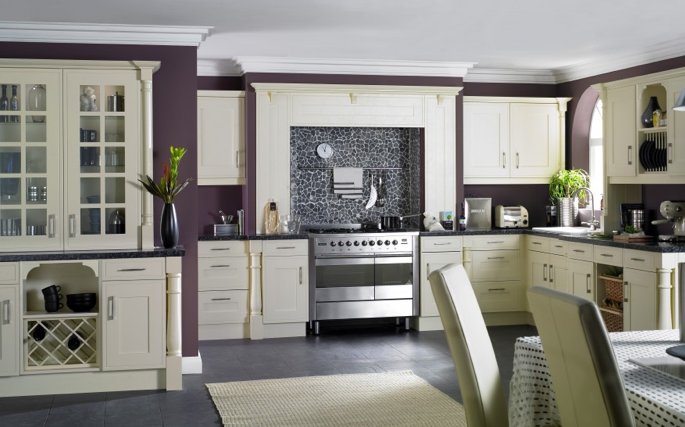 Last but not least, this kitchen is the ultimate in eclectic design. It’s rustic, fun, and breaks all of the rules. Which one is my favorite? Tough choice, but ultimately the fireplace and dog win! How about you? Categories: Interior Design & Decorating | Tags: Architecture, blue kitchen, bold kitchens, cabinetry, cabinets, color, colorful kitchens, contemporary, countertops, eclectic kitchens, eco-friendly kitchen, gray kitchen, green kitchen, Home Decor, Home Decorating, industrial, industrial lighting, kitchens, lighting, modern, mosaic backsplash, pendant lights, pink kitchen, red kitchen, repurposing, rustic | Permalink. A mild case of Pinterest fever. So what is the excitement about? Remember in the past when you would stumble upon a great internet tutorial, some amazing photos that inspired a decorating project, or a yummy recipe that you just had to try? You printed out the material or bookmarked the links, and promptly forgot about them. It’s simply too overwhelming to keep track of everything and find it again. Enter Pinterest. You can categorize all of your different “favorites” and images from Web sites on a variety of different boards. How genius is that? My boards include recipes, places I’d love to visit one day, and of course interior decorating themes organized by decorating style, color schemes, and lifestyles. So how does it work? It’s an online scrap booking tool that allows you to “pin” online photos to a virtual bulletin board. The really cool part is that it keeps track of the original source of the picture. Thus you can always go back to where you found it, simply by clicking on the photo. Color scheme – Keep track of pictures that include colors you love. DIY ideas – Pin innovative projects. Go green – Add pictures of sustainable designs that resonate with you. 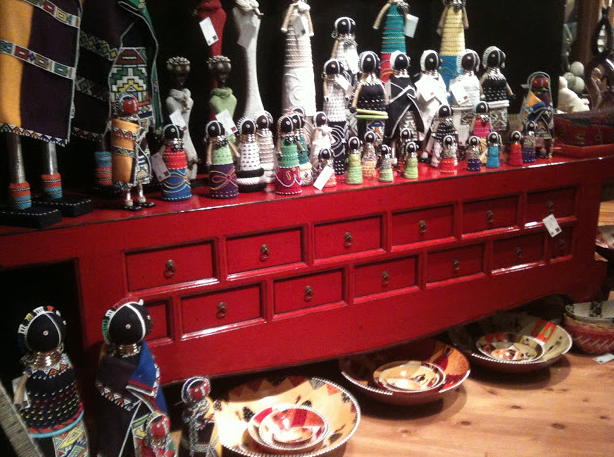 Fun items for the home – Include photos of quirky, unique items that you don’t need, but absolutely want. Baby’s room – Collect ideas to create a beautiful space for your bundle of joy. As an added bonus, you can even “share” boards. I often encourage my clients to set up boards with their inspirations and favorites to be shared with me, so that I can better understand their style. Now please note that there have been some concerns in regards to copyright permissions at Pinterest and they have updated their policies recently. So do a little research if you have concerns about this subject. 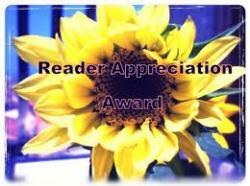 Leave a comment with your e-mail address if you would like to receive a Pinterest invite from me. 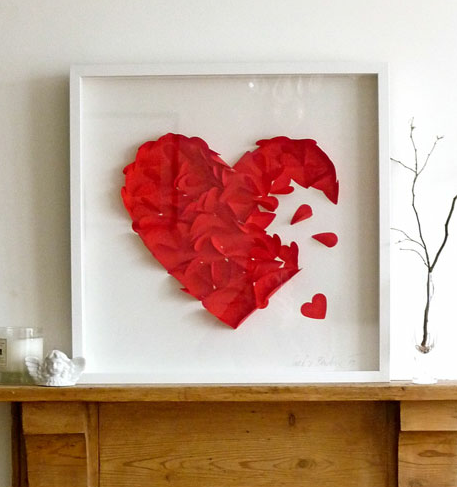 In fact, if you have Pinterest fever “repin” this post! Have you tried out Pinterest? What are your thoughts? Do you have amazing boards we should follow? Categories: Interior Design & Decorating | Tags: boards, color schemes, Home Decor, inspiration, Interior Design & Decorating, online organization, pinterest, pinterest addiction, pinterest fever, scrap booking | Permalink. Here are some of my favorite design trends, and yes, some not so favorite ones as well. For the home, this slipcovered Ikea chair is one of my favorites (also from Etsy). I can just picture it in a baby’s room for either a boy or a girl! Warm gray walls would be a great backdrop for the colorful chair. Yes, gray has become the new beige and the “right” gray can certainly make a design statement while still being neutral. One of my favorite grays is Revere Pewter by Benjamin Moore. I’ve used this warm gray in bathrooms and bedrooms. It always looks best when paired with hardwood floors or tile and white trim. 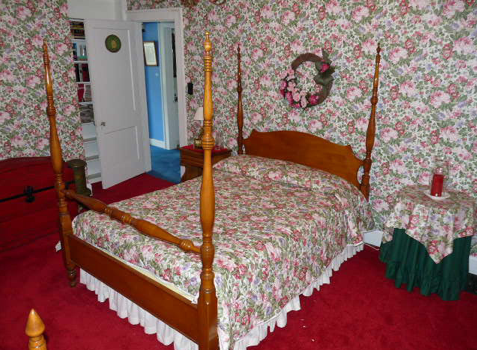 Lastly, wallpaper is one of the hot trends right now. The latest designs are a far cry from the overwhelming florals and primary colored stripes you may remember from your youth. Check out these beautiful wallpapers by www.wallteriors.com and www.jonathanadler.com. So, what are my least favorites on the design front? Excessive matching is not a good look. There is a huge difference between matching and complementing. Complementary pieces or colors coordinate and pull a room together but add interest. No color, no architectural feature, nothing interesting for the eye to see will be bland, while a pattern that spills from the furniture to the walls to the accessories is overwhelming. 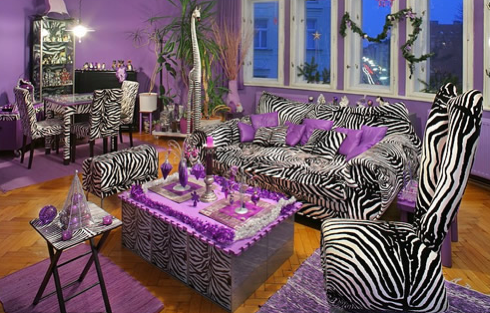 This room is certainly an extreme, but all the same it is a dizzying example of matching overkill. Courtesy of Ugly House Photos. 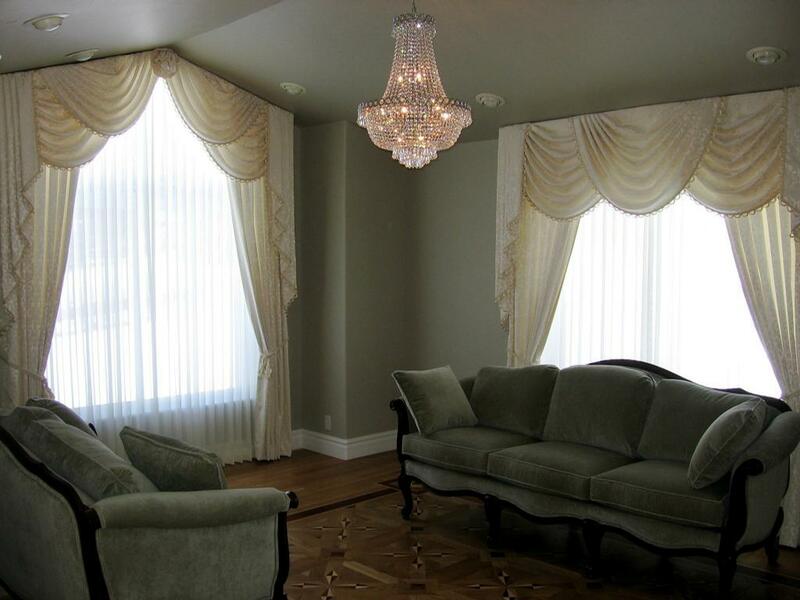 Unless you live in a luxurious castle, swag curtains are a home decor don’t in my chapter. Windows in any regular home will be swallowed up with swag curtains. On that note, I’m not partial to any type of curtains that block too much of the window. Let in some light! Jersey Shore style with loud colors and clashing animal prints is anything but classy. 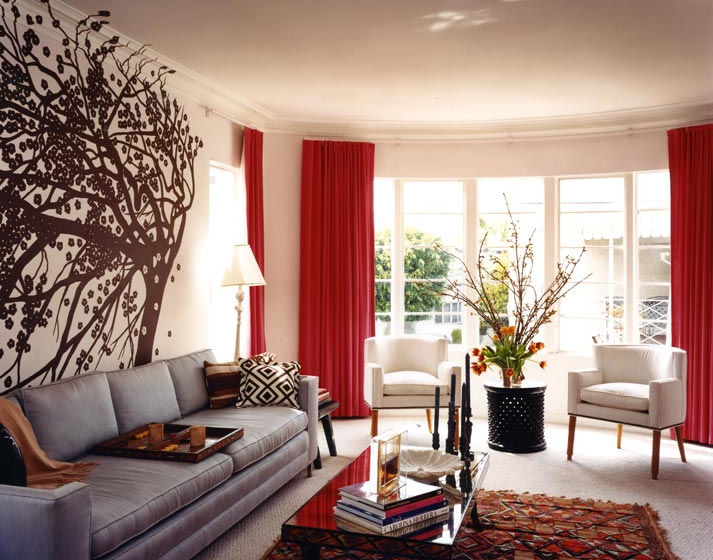 A zebra rug or other animal print accessory is stylish when done tastefully. The same goes for bold colors. But unless you want to be mistaken for a poacher, this style should be avoided. Some spaces give beige a bad name. A warm beige that pops against a white trim is classic. 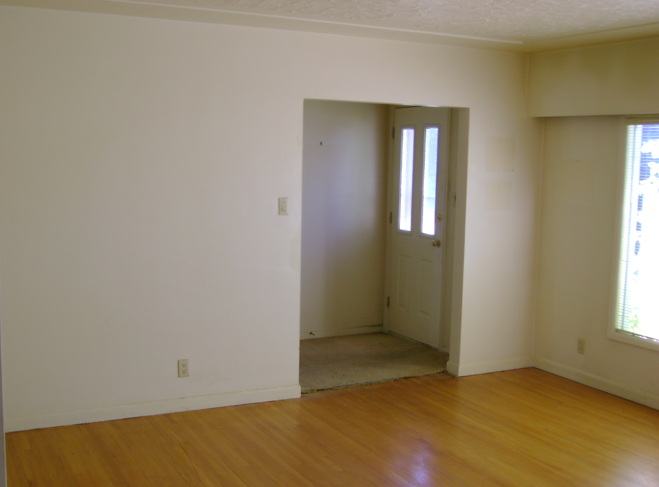 However, when the walls and trim are painted in the same pale beige color with a flat finish without even a hint of semi-gloss on the trim, it becomes the dreaded builder’s beige. It will make any room sterile and uninviting. The example below, is thankfully a “before” photo. So there you have it, my design favorites, along with the trends that make me cringe. What are some of the trends you either love or hate? Categories: Interior Design & Decorating | Tags: Animal Print, Architecture, Benjamin Moore, Chevron, Chevron Purse, Curtains, Decor Trends, Design Disasters, Design Do's, Design Don'ts, Design Trends, Etsy, Gray Wall Color, Home Decor, Home Decorating, Home Design, Ikea, Interior Design & Decorating, Iris Interiors LLC, Jersey Shore Style, Jonathan Adler, Matching, Revere Pewter, Slipcover, Swag Curtains, Wallpaper | Permalink.